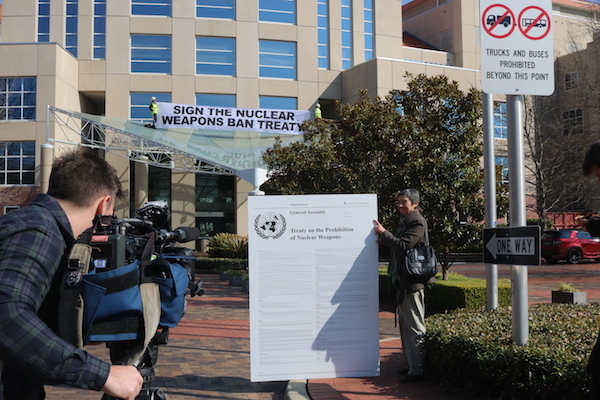 Sue Wareham holds copy of Ban Treaty during ICAN Australia action at the Foreign Affairs Department in Canberra in September. In my first article about the Treaty on the Prohibition of Nuclear Weapons (the Treaty), published on Power to Persuade on 28 July, I described how the Treaty came about, how it is based in humanitarian and human rights norms, what’s in it, and that the next step would be the opening for signature at the UN in New York on 20 September 2017. Because the Treaty text was adopted only on 7 July, it had to be squeezed into an extra early morning slot during ‘leaders’ week’, the opening week of the new annual UN General Assembly (UNGA) session, when many heads of government and state and foreign ministers are in town. So many were keen to sign at this earliest possible opportunity that each was allocated just one minute for the formal signature on behalf of their nation. Three, like Thailand, ratified the treaty at the same time as they signed it. In all, 50 governments signed the treaty on the opening day, and another 3 signed over the next 2 days. More will follow over the next days, weeks and months. It will enter into force and become binding international law for those who join it 90 days after 50 states have ratified the Treaty. As this takes time, often involving departmental reviews and parliamentary action, entry into force is expected during mid-late 2018. This treaty is not only historic in substance; the process of its genesis has also uniquely transformed the previously moribund nuclear disarmament landscape. For the first time, a nuclear disarmament treaty has been led by the states without the weapons. For the first time, a nuclear disarmament treaty has an unequivocally humanitarian basis. During both last year’s UNGA working group that recommended a nuclear prohibition treaty as the next best feasible step the world could take towards nuclear disarmament, and the negotiations themselves, the level of participation of civil society was unprecedented. Japanese hibakusha and Indigenous nuclear test survivors, including Sue Coleman-Haseldine and Karina Lester from Australia, were prominent. This had the profound effect of constantly anchoring the negotiations in the reality and lived experience of what nuclear weapons do, and why concluding an effective treaty was of utmost importance. The UN was for the first time in 21 years the forum in which a nuclear disarmament treaty was negotiated; as its most representative and democratic forum, the General Assembly, is able to adopt substantive measures by 2/3 majority vote. This is in stark contrast to the NPT review conferences and the UN Conference on Disarmament (CD), which are paralysed by a requirement for consensus (the CD has been unable to agree even on an agenda for 21 years). Being adopted in the most inclusive global forum by such an overwhelming majority (122 to 1) also affords the Treaty credibility. Not only was the UNGA process effective in negotiating a comprehensive, categorical prohibition of nuclear weapons, it was efficient. The Treaty was able to traverse from negotiating mandate to adopted text in just eight months, with only four weeks of actual negotiations. The naysayers largely choosing to boycott the process helped it move along, but there was also a remarkable determination by most of the world’s governments to seize this landmark opportunity in the time available, and put aside much of the national and parochial agendas that often beset international negotiations. Each successive draft of the treaty was strengthened during the negotiations. The Treaty thus represents a seismic shift in bringing global democracy to nuclear disarmament, and in asserting the interests of shared humanity. The treaty negotiations were charged “to conclude as soon as possible a legally binding instrument to prohibit nuclear weapons, leading towards their total elimination”. This dual mandate is significant, but challenging. Negotiating the detailed, time-bound, verified, binding cascade of steps required to eliminate nuclear arsenals clearly requires the committed involvement of the states which own the weapons. But the nuclear-armed and nuclear-dependent states stayed away (with the exception of the Netherlands, which made clear on day one that it could not support any treaty that would result), and none of the nuclear-armed states demonstrate any intention to deliver on their obligation to disarm. The treaty does include a clear path for states which own or have owned nuclear weapons, or those with nuclear weapons stationed on their territory to join the treaty; by verifiably and irreversibly dismantling their nuclear weapons, nuclear weapons program and facilities, under a time-bound plan agreed to by states parties to the Treaty. Or they can eliminate their weapons and weapons programs, and then cooperate with the designated competent international authority to verify that they have irreversibly eliminated their nuclear-weapon program. The challenge now is for governments and civil society to work together to promote and implement the Treaty, and use it as a lever to push elimination. These states should of course sign and ratify the Treaty at the earliest opportunity. Once it enters in to force, they will need to enact national legislation enshrining their commitments under the Treaty. This will include a variety of legal and administrative measures, including criminal sanctions for persons subject to their jurisdiction who engage in activities prohibited under the Treaty. As some countries, such as Germany and Switzerland, have done in relation to the legislation giving effect to their obligations under the cluster munitions ban treaty, national legislation could be more specific than the Treaty itself, for example in detailing types of assistance for nuclear weapons programs which are prohibited. These could usefully include financing of nuclear weapons production; or knowingly permitting transit of nuclear weapons through their land, airspace and territorial waters. They should educate their officials, parliamentarians, journalists and publics, including young people, about the Treaty, its basis and importance. They have a good story to tell. In fulfilment of their Article 12 obligation to encourage all states to join, they should explain the basis for their support for the Treaty, and urge states which have not yet joined to do so, as a regular part of their bilateral, regional, multilateral and international diplomacy. Their embassies and consulates in states which have not yet signed the Treaty should promote it at every opportunity, every relevant anniversary. They can name and shame nuclear weapon retaining-states and nuclear weapon producing corporations, and shun key individuals. A time may come for sanctions and boycotts. States supporting the Treaty should support the work of civil society organisations working for the elimination of nuclear weapons, including in nuclear-armed and nuclear-dependent countries. As discussed by Princeton physicist Zia Mian in his excellent piece “After the nuclear weapons ban treaty: A new disarmament politics” in the Bulletin of the Atomic Scientists the day the Treaty was adopted, states supporting the Treaty could also seek to further strengthen the prohibition of nuclear weapons in international law by seeking an amendment to the statute of the International Criminal Court, to define the use of nuclear weapons as a war crime. The Court’s statute provides for such an amendment relating to indiscriminate weapons which are the subject of a comprehensive prohibition, which the ban treaty is. For the first time in a nuclear disarmament treaty, Article 6 of the Treaty commits states parties to provide needs-based assistance to victims of nuclear use and testing under their jurisdiction, and to undertake environmental remediation of areas contaminated by nuclear weapons testing or use. These obligations provide an important basis for advocacy to ensure that the rights and ongoing needs of those harmed by nuclear testing or use are addressed and not forgotten; and that contaminated environments are monitored on a long-term basis and remediated where feasible. These provisions will have particular relevance if and when Algeria, Australia, China, Japan, France, Kazakhstan, Kiribati, Marshall Islands, Russia, UK and/or USA join the Treaty. The Treaty’s Article 7 provisions commit states parties to cooperate with other Treaty members to facilitate the Treaty’s implementation. It obliges those in a position to do so to assist victims of nuclear use or testing. These provisions are ground-breaking. Survivors and civil society organisations will have a major role in ensuring governments act on them. The establishment of an international fund for nuclear victim assistance and environmental remediation to which states parties contribute could be a useful way to implement these obligations. The significance of the Treaty is most clearly evidenced by the consistency and strength of the opposition from nuclear-armed and dependent states at every stage of its development. A notable example is the October 2016 US admonition, before the UNGA vote on ban treaty negotiations, to its NATO allies to vote “no”, and if the negotiations start, not to join them. The reasons they state bear no resemblance to their public pronouncements that the ban would be ineffective, divisive and counterproductive. They recognize that a ban treaty “aims primarily to stigmatize nuclear weapons and … delegitimize the concept of nuclear deterrence”, that it “could impact non-parties as well as parties, and could even have an impact prior to its entry into force”, and interfere with NATO preparations to use nuclear weapons. That is, the Treaty would work as intended. Other examples are the immediate dismissive angry response from France, UK and US when the Treaty was adopted: “We do not intend to sign, ratify or ever become party to it. … Accession to the ban treaty is incompatible with the policy of nuclear deterrence”; and the recent admonition of US Secretary of Defense James Mattis to Sweden not to sign the Treaty. Many other countries are copping similar pressure. Clearly the Treaty is not something the nuclear-armed states can ignore, and has put them on the defensive. The Treaty is of course a legal agreement, but it also has political, ethical, social and economic dimensions. The value of the Treaty in advancing the elimination of nuclear weapons depends on how effectively and widely it can be implemented, promoted and used. It will be taken more seriously if a large number of states sign and ratify it and it enters into force promptly. In addition the Treaty needs to be promoted as a global good of high order. Opposition to and undermining of the Treaty by nuclear-armed and dependent governments is likely to grow; and mass media are all too frequently hostile or indifferent. Therefore an important task is education and promotion to make parliamentarians, journalists, people everywhere aware of the Treaty and what it means. Parliamentarians around the world should be urged to sign ICAN’s Parliamentary Pledge for the Treaty on the Prohibition of Nuclear Weapons, thereby pledging to work for the signature and ratification of the Treaty by their governments. By 23 September, 53 Australian federal parliamentarians had signed the pledge, including more than half of Labor members, members of the Liberal and National parties, NXT, an independent, and all parliamentary Greens members. One powerful way the Treaty can be used is to promote divestment by public funds, banks and superannuation funds from companies that produce nuclear weapons. Many financial institutions worldwide that have stopped investing in makers of other banned weapons, such as landmines and cluster munitions, should now also divest from nuclear weapons producers. On the day the Treaty opened for signature, New York-based Amalgamated Bank became the first US bank to announce that it does not invest in manufacture of any type of weapons. While governments can introduce boycotts and sanctions on key nuclear-weapons related organisations and individuals, civil society can also use the well-established tools of naming, shaming, organising boycotts, and protesting whenever key individuals appear in public. In nuclear-armed and dependent states, building a broad public movement that can turn political parties and governments from seeing nuclear weapons not as an asset, but recognizing the extreme security threat they are, is a task made even more urgent by the current alarming frenzy of escalating nuclear threats and brinkmanship, particularly between North Korea and the US. The first chinks in the nuclear edifice are already evident, with differences among the nuclear-armed states emerging. China is much less hostile to the ban than are France, Russia, UK or US. It seems perhaps more likely that cracks will open among nuclear-dependent states. If governments change and political opportunities emerge in one or other such state, it will be important that both domestic and global civil society can rapidly mobilise – like a swarm of bees – to seize that opportunity. Among nuclear-armed states, the UK seems the most likely candidate to give up its nuclear arsenal, given support by a majority of the public and Labor leader Jeremy Corbyn for such a move, a high level of contestation about the future of Britain’s Trident nuclear submarines and missiles, and the possibility of a more independent and nuclear-free Scotland. The landmark Treaty on the Prohibition of Nuclear Weapons is a necessary but insufficient step towards their abolition. It is a triumph of the interests of common humanity. Using the powerful new tool the Treaty provides in the historic task of eliminating nuclear weapons is urgent work for all of us.